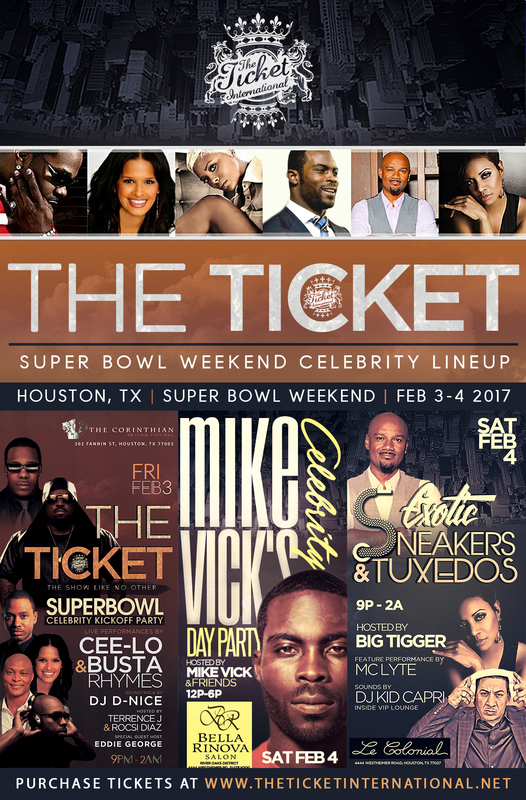 The Ticket International, an exclusive, private membership organization dedicated to connecting exceptional and inspirational individuals both socially and professionally, has an all-star Super Bowl Party lineup in Houston for the Big Game Weekend. The events kickoff on Friday night at the Corinthian, with Busta Rhymes, Terrence J, Rocsi Diaz, Eddie George, and DJ D-Nice. 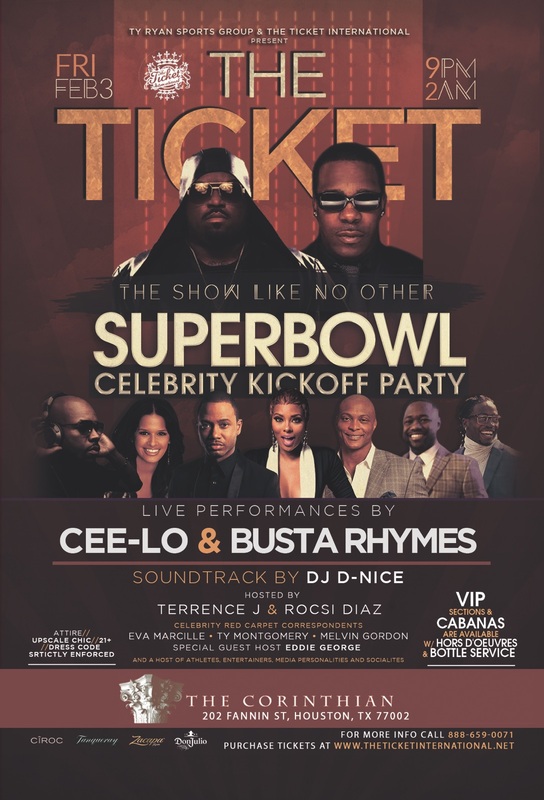 ABOUT: According to promotional materials, the event features a performance by Busta Ryhmes, soundtrack by DJ D- NICE, Cee Lo Green, with hosts Terrence J (2.2 Million Instagram Followers) & Rocsi Diaz (over 634K Instagram Followers). Celebrity red carpet correspondents: Eva Marcille (over 1.5 Million Instagram followers), Ty Montgomery (Green Bay Packers RB), Melvin Gordon (LA Chargers Pro Bowl RB), and special guest host Eddie George (Heisman Trophy Winner, NFL Legend). There’s nothing like this event out there right now. Amazing ticket value, considering the open bar, fun music, and over-the-top guest list. ABOUT : This appears to be a very unique opportunity to see Michael Vick in a relaxing upscale venue near the Galleria area in Houston, The Bella Rinova Salon. 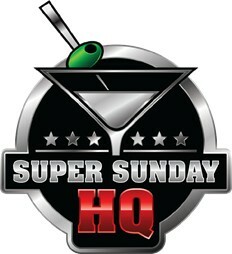 DJ Rob G is set to provide the music for this chill event. 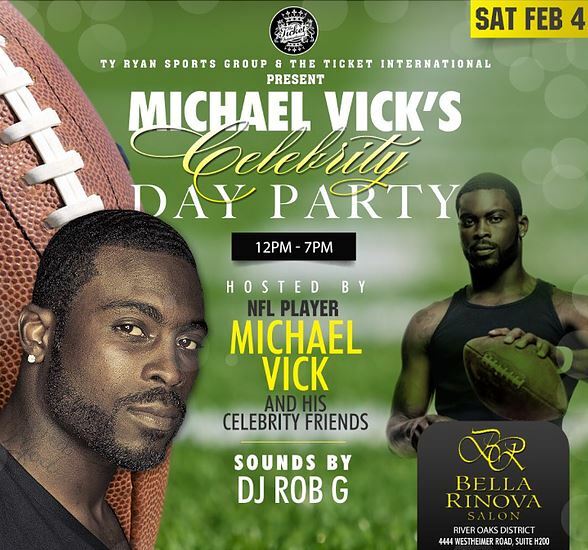 Michael Vick, one of the NFL’s most exciting QBs ever, is set to bring some celebrity friends along. ABOUT : The stage is set for a top-shelf Super Bowl bash at Le Colonial restaurant, a two-story destination serving classic Vietnamese cuisine amongst upscale, French colonial decor. Big Tigger, with over 600K Instagram followers, is set to host the exotic Suits & Tuxedos party on Saturday Night. Darian “Big Tigger” Morgan, also known as Big Tigg, is an American television and radio personality best known as the host of BET’s Rap City and 106 & Park. One of the classic female hip-hop artists, MC Lytre, is set to perform, and DJ Kid Capri, one of the most legendary pioneers of the turntables, is set to spin in the VIP. Terrence J should be stopping by, and the event features celeb correspondents: Andrea Gomez (Houston TV News), Justin Bethel (NFL Player), Jarvis Landry (NFL Player). The event is also sponsored by Momentum BMW. The event will feature a first class lounge for VIPers, our signature iconic brands and entertainment.